Humans are, and history certainly proves this out over and over and over again, epistemologically arrogant. We think we know more than we know. And one of my metrics for a good doctor is how often they say, “This could be wrong” or “We don’t know.” And, in fact, good doctors will jokingly often say, “50% of what we know is wrong, we just don’t know which 50%.” We really are only scratching the surface of understanding the environment in which we live, much less ourselves. When I find myself 100% certain of a market outcome I try to use that as a signal to re-check my initial assumptions. The markets are a very humbling place. Those who don’t appreciate this fact aren’t going to be very successful because the market doesn’t care what you think or how you feel. Much of the epistemological arrogance in finance stems from career risk and misplaced incentive structures. When you add in ultra-competitive people who are well-educated with type-A personalities you have a recipe for a group that thinks they know more than they know. This aura of certainty that finance people put out there can be very comforting to those outside the world of finance who are looking to these masters of the universe for advice or guidance. Yet it’s a false sense of security. Ted: Go on, I’m listening. Ted: Yeah, makes a man feel good. Tommy: Course it does. Why shouldn’t it? Ya figure you put that little box under your pillow at night, the Guarantee Fairy might come by and leave a quarter, am I right, Ted? Ted: But why do they put a guarantee on the box? Tommy: Because they know all they sold ya was a guaranteed piece of sh* t. That’s all it is, isn’t it? Hey, if you want me to take a dump in a box and mark it guaranteed, I will. I got spare time. But for now, for your customer’s sake, for your daughter’s sake, ya might wanna think about buying a quality product from me. 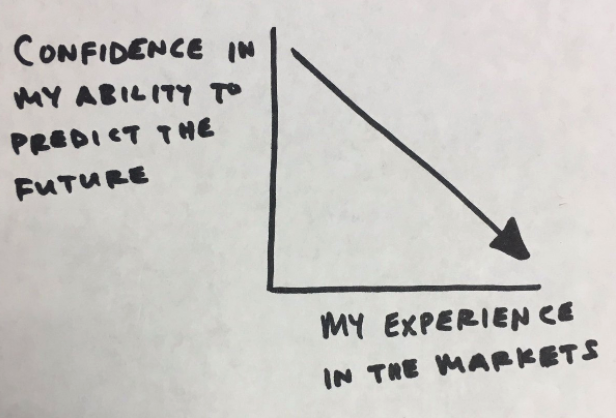 It may not feel right because of the way we’re hardwired to be overconfident in our own skills, but I think the first step towards becoming a better investor is letting go of any illusion of certainty and having the willingness to admit that the markets are hard. Once you can admit these things to yourself it allows you to avoid so much of the noise that pollutes the world of finance and frees you up to focus on things that really matter.